SCLA is proud to announce our new Varsity Head Coach and Program Director, Bruce Frady, to the Southlake Families! The 2018/19 fall season start will be the week of September 10th, make sure you're registred to play! Don't forget to be doing your "Home Workouts" from Coach Delano! 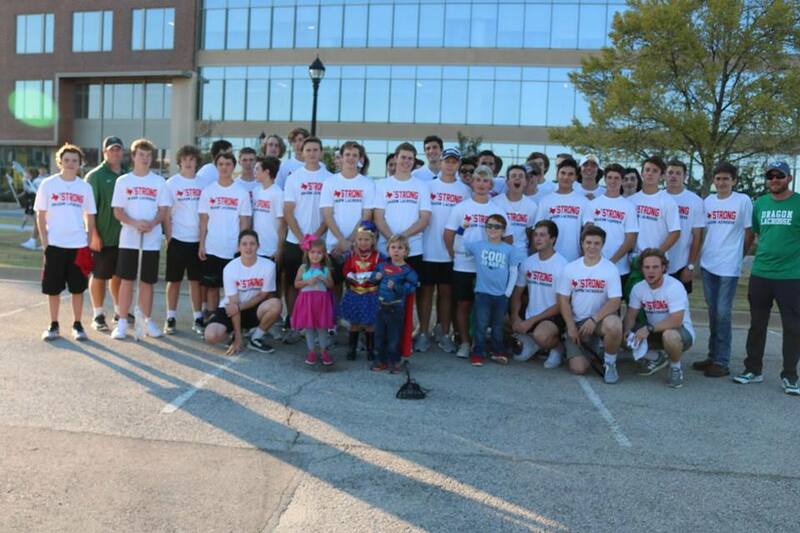 The men's high-school Dragon lacrosse team has been deemed the best in Texas. The team was awarded the Bob Patterson Trophy and recognition as the state’s top program. The annual award, presented by the Southwest Lacrosse Officials Association (SWLOA) membership, recognizes the top Texas men’s high-school program for their sportsmanship, quality of play, respect for the game’s character, and the honor that they bring to the sport. Tim Cagney, President of the Dallas/Ft. Worth chapter of SWLOA, presented the trophy along with the awards namesake, Bob Patterson, a former President and Chief Referee of the SWLOA, at the Dragons’ year-end banquet. The award honors the long-time service of Bob Patterson, who has personally experienced the dramatic growth of lacrosse in his 47 years of involvement in high- school and collegiate lacrosse. 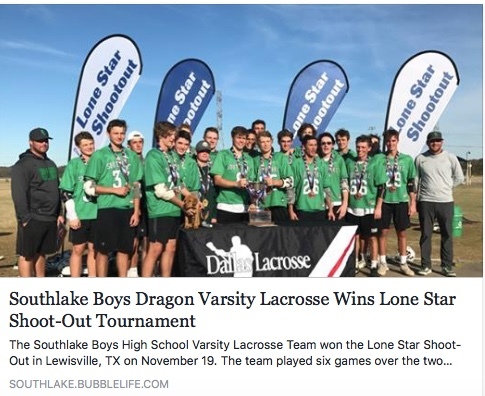 Each player received a medal, and the Southlake Carroll Lacrosse Association (SCLA) has a trophy that will be displayed at Carroll Senior High School. In other year-end awards, Junior Defenseman Jack Welding repeated as one of just 16 2015 All-American awards for the state of Texas. Receiving North District Honorable mention awards were: Senior Midfielder Michael Cox; Juniors Midfielder Dean DiBello and Defenseman Nathan Beam; and Sophomores Goalie Luke Millican and Attackman Casey Wasserman. Senior Zachary Bach, who plans to play lacrosse at the University of North Texas, won the 2015 SCLA Scholarship. A banquet ended with Varsity Head Coach Bart Sullivan recapping the careers of the other seniors including Michael Cox (Sienna College), Brennan Mollere (Texas A&M), Taylor Iniguez (Texas Tech), Josh Sommerhalder (Baylor University), and Alex Barnes (University of Texas – Tyler). Six Dragon Rising Freshmen Boys to represent Team Texas at Brine National Lacrosse Classic. Six Southlake players will represent Texas as 2013 Brine National All-Stars at the 2013 Brine National All-Star Lacrosse Academy and Brine National Lacrosse Classic to be held in Boyds, Maryland July 1-3, 2013. Selected to represent Team Texas are incoming Southlake Carroll Freshmen Attackmen Lindell Stone and A.J. Van den Dyssel, Midfielder Jack Johansson and Defenseman Michael Tsay. Goalie Luke Millican of Liberty Christian and Attachman Casey Wasserman of Grapevine Faith Academy were also selected to the squad. All six players were teammates on the Dragon Select U15 team that qualified this past weekend in San Jose for the US Lacrosse National Championships in Orlando. The Brine National All-Star Lacrosse Academy brings the top middle school lacrosse players in the country to one venue. Regional teams will compete to become the 2013 National Champion and are coached by NCAA lacrosse coaches.